The gritty and grizzled veteran has decided to give baseball one more go-around before he retires his mitt for good. The Royals announced today that they have signed the former All-Star to a minor league deal and will send him to Double-A Northwest Arkansas where he’ll be expected to aid in the development of the organization’s top pitcing prospects – namely the recently-demoted Mike Montgomery. At 38 years old, Kendall is hardly a guy who is just fighting for a shot at the big leagues. He’s basically giving one last-ditch effort in order to salvage an already historic career. Jason last played in the majors back in 2010 with the Royals before he had surgery in September of that same year on a torn rotator cuff. After attempting to come back in 2011, he re-injured his shoulder and had to undergo another surgical procedure – causing him to miss the entire season. His contract was not renewed after the season, leading him to become free agent. 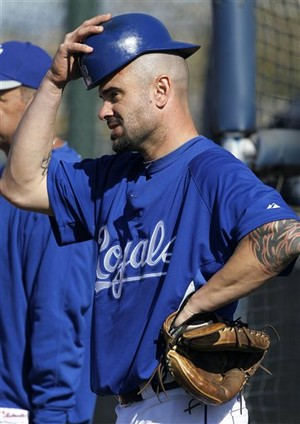 The Royals opted to sign Kendall as more of a depth move than anything. An organization can never have too much depth at any position, and we here in Kansas City have seen what can happen when two of your catchers go down with significant injuries. Jason has been with the organization throughout his time as a free agent, serving as an unofficial catching instructor. Through 15 seasons (1996-2010), Kendall owns a career slash line of .288/.366/.378. His 2085 games played ranks fifth all-time amongst all catchers, while his 189 career stolen bases ranks him first all-time at the position.